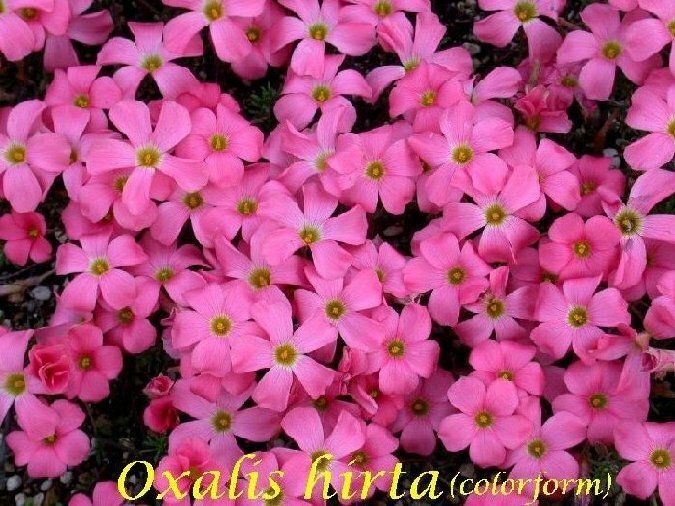 Oxalis hirta is a fall blooming South African species with grey-green trifoliolate leaves and mauve, magenta, or white flowers. 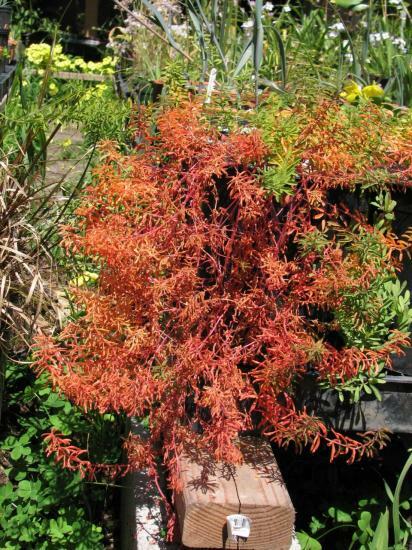 It grows on flats and slopes in the north and southwest Cape. 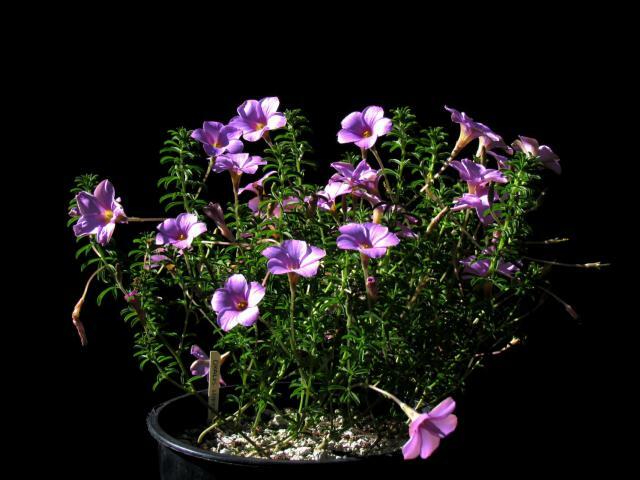 It is one of the largest of the Oxalis species in South Africa due to the stronly erect main stem (~1ft/30 cm) that appears from each bulb. The bulbs can get very large as well. 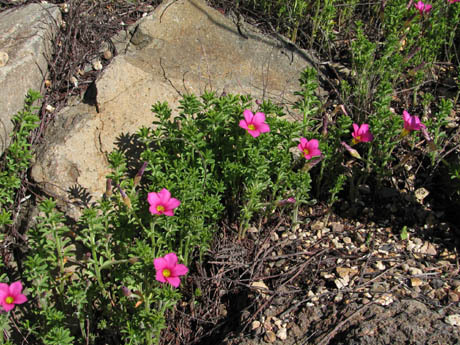 The photos below shows the typical form of the species with magenta flowers. Photos 1-3 were taken by Mary Sue Ittner. 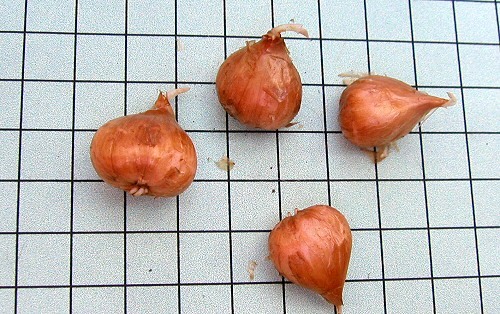 Photo 3 shows the bulbs on a 1 cm square grid. Photos 4-6 were taken by Nhu Nguyen. 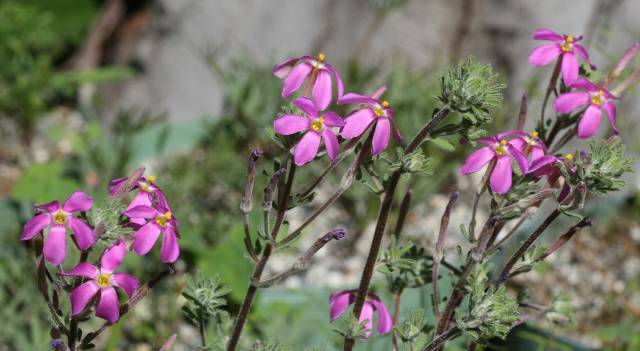 Photo 4 from the UC Botanical Garden shows what this species probably looks like in habitat, attributable to the wonderful landscaping of the South African section at the Garden. The photos below shows a form from Bill Dijk including one that is so floriferous that you can't see the leaves. The photo below from Andrew Broome shows a salmon colored form. 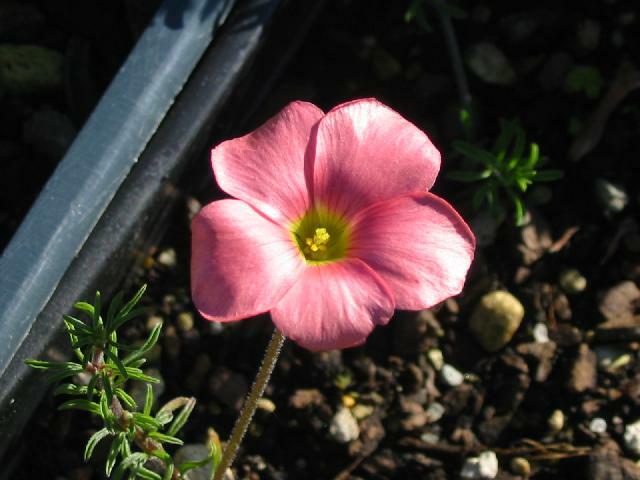 Oxalis hirta 'Gothenburg' originally came from Henrik Zetterlund at the Göteborg Botanical Garden, Sweden, thus was given the cultivar name 'Gothenburg'. 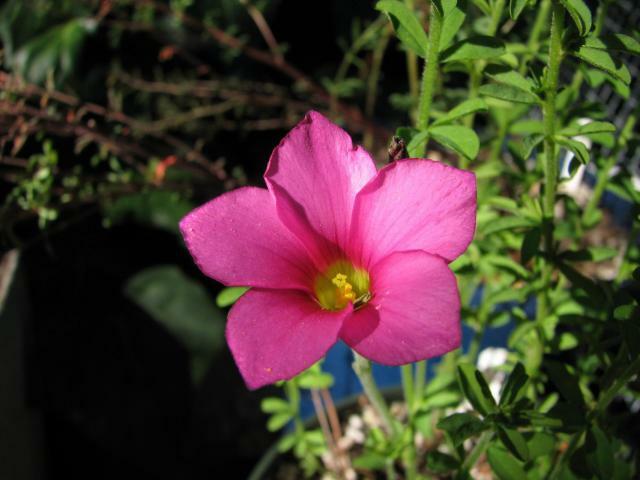 It is a robust fall bloomer with pink flowers and gigantic bulbs. It seems to benefit from a deep pot as I never got it to bloom when planted in a shallower one. 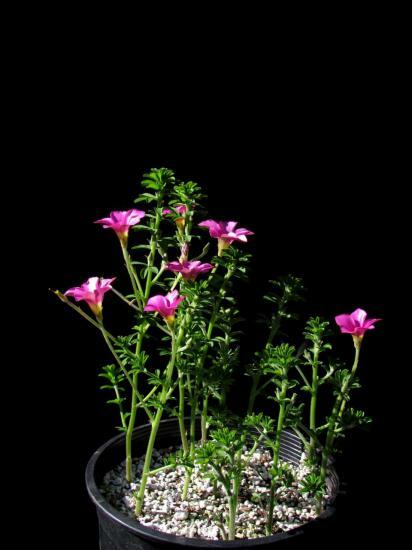 It is truly dazzling as so many of the flowers open. Photos below by Bob Rutemoeller and Mary Sue Ittner. 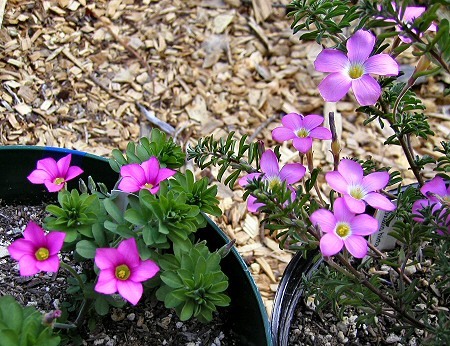 The third photo of the cultivar next to another form shows how much finer and a little more gray the leaves are of the cultivar pictured on the right. It is also much taller. 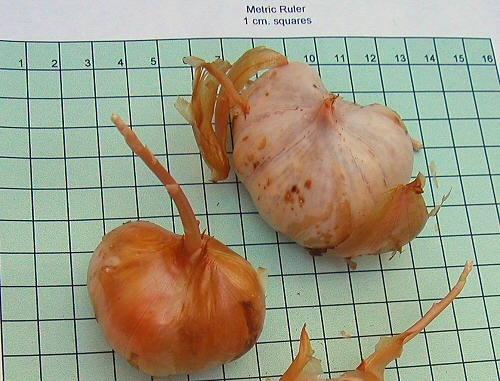 The final photo shows the enormous bulbs on a grid of 1 cm squares. 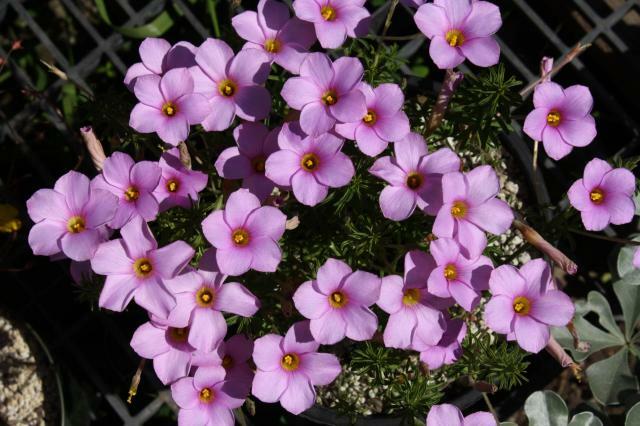 Oxalis hirta 'Mauve' is a robust form with mauve flowers. Photo 1 was taken by Mary Sue Ittner and photos 2-6 were taken by Nhu Nguyen. Photo 4 shows this form with O. perdicaria. 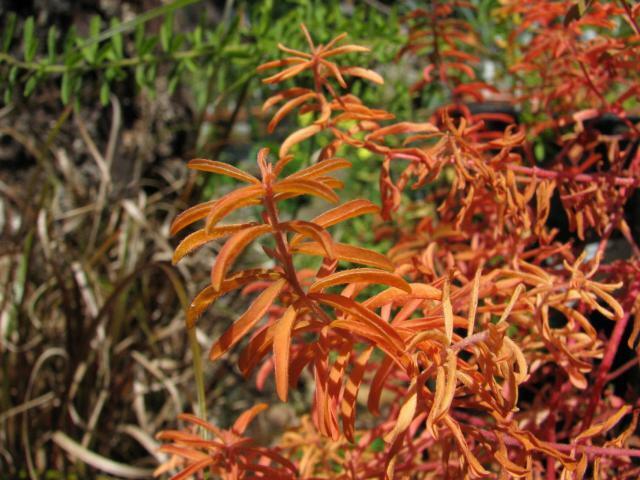 Photos 5-6 show senescing leaves that can be quite showy. 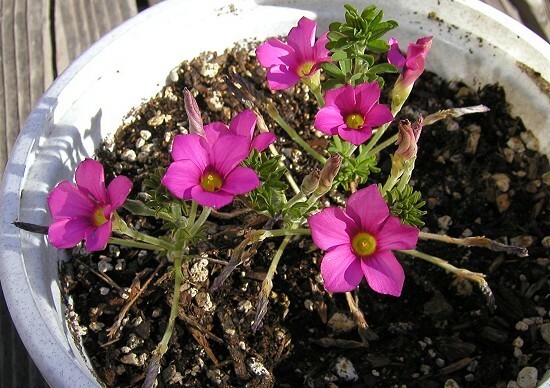 Oxalis hirta var. 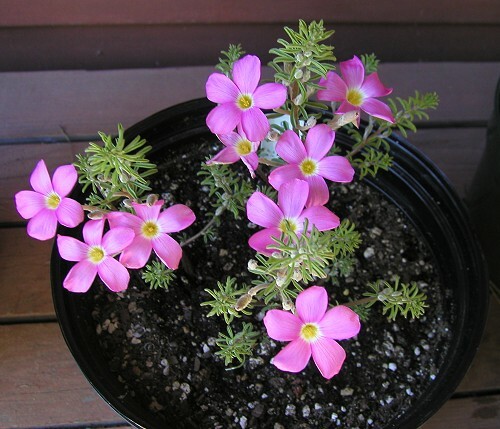 tubiflora (Jacq.) Salter. 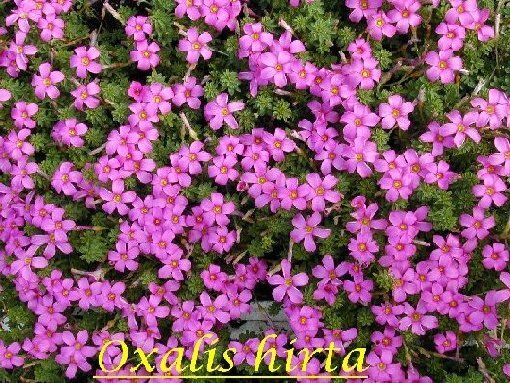 This variety of O. hirta comes from the northern part of Western Cape Province. 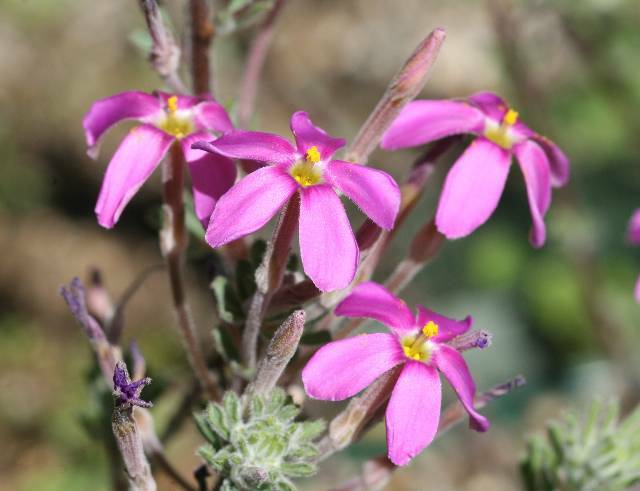 The photos below show flowers of a clone found near Vanrhynsdorp. 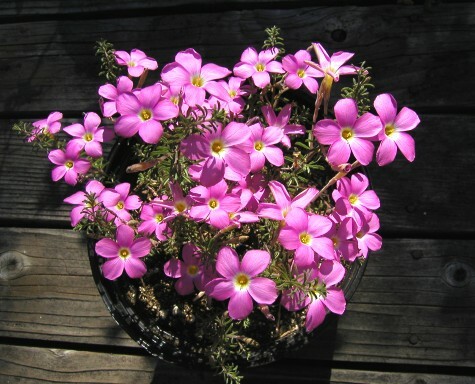 The bulbs produce tall plants, with flowering stems of 12 inches (30 cm) or higher. 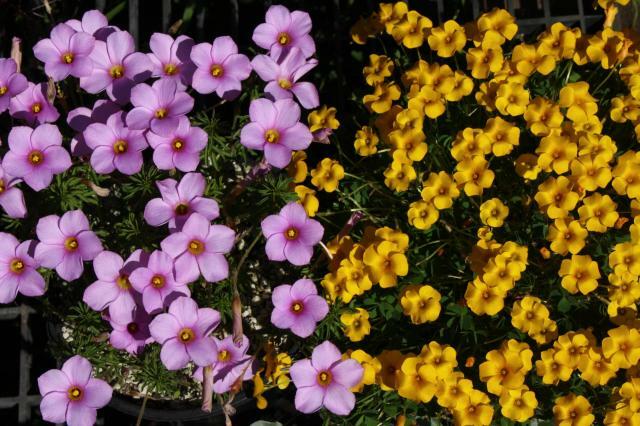 The blooming season in California starts in October and continues for several months. The few leaves shown on each stem are small and downy. From a distance they appear gray. 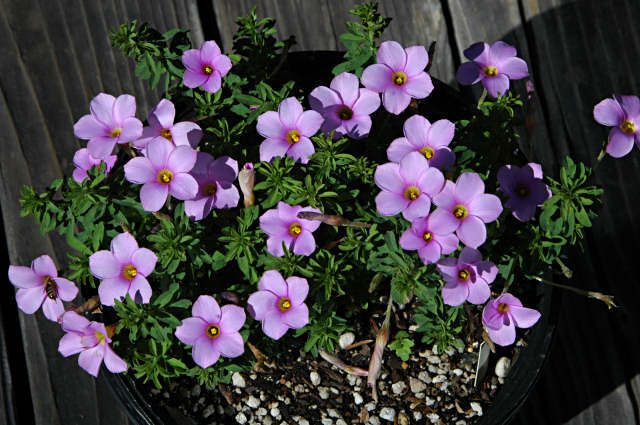 The individual petals are narrower than on O. hirta and in full sun they reflex on warm days, another feature not shown by the species. 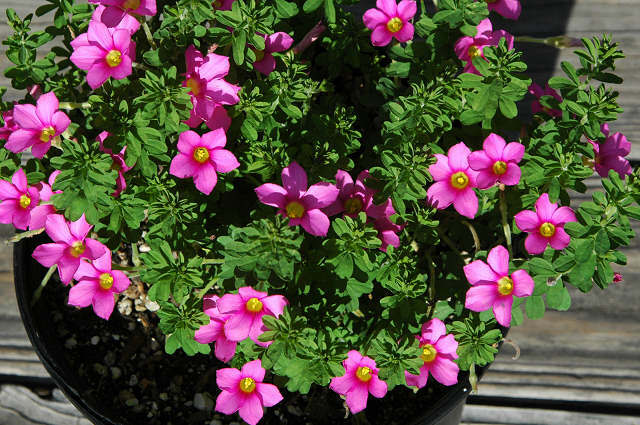 Its greater height makes the plant an excellent choice to stage behind other oxalis species on a bench or, if planted out, to place between low-growing shrubs. Photos taken in his garden are by Andrew Wilson.